Yesterday on a wet and rainy Puunui morning my helper and I visited my Grandparent’s grave at the former site of the Ma’eMa’e Sunday School. I have many fond memories of attending family functions, holiday potlucks, and Sunday School there. I miss the warmth of the pews; the Na Himeni bound in red dotting each row. I miss ringing the bell – its cheerful tone marking the start of another Sunday afternoon service. 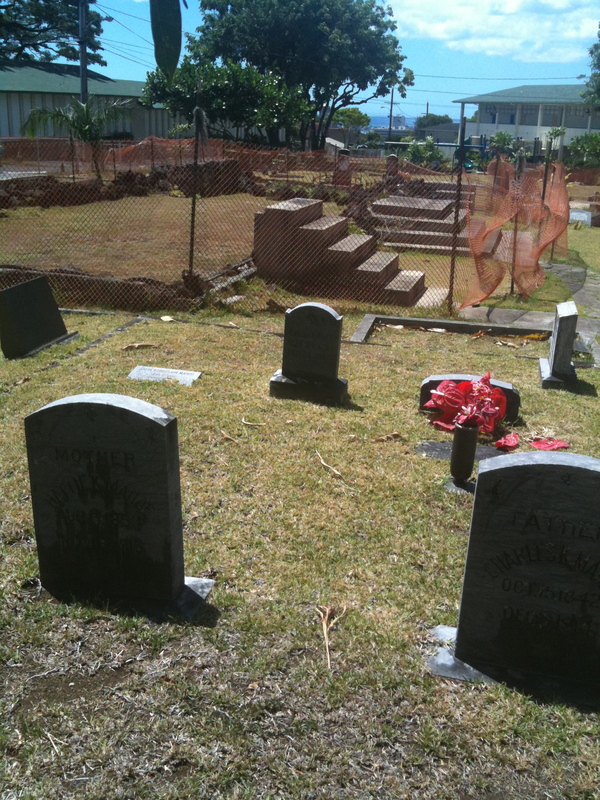 I miss the scent of the plumerias that used to shade my grandparent’s graves….removed I guess to make the landscaping and upkeep of the grounds fuss-free. A surreal feeling envelopes you as you wander this tiny cemetary. We took a brief shelter from the Nu’uanu rains under the last remaining large tree on the top side of the chapel. Many of the Mahoe family are buried in this area of the grounds. Kaumakapili Church Deacon Charles Mahoe started this sister chapel with his wife Haleaka. I understand the Ma’eMa’e bell is now at Kaumakapili and continues to be rung every Sunday. The stark foundation and concrete steps leading to nowhere where the little green chapel in which my parents were married once stood till extreme winds blew down the 137 year old chapel in May 2000. Orange “safety” netting now surrounds the stone foundation. Garish and out of place in this peaceful setting. Not only are my grandparent’s there, but also my great-grandparents Lino Fernandez, II and Phillipa Fernandez, great-great-grandparents Joseph & Sarah Kauhimaka, and great-great-great-grandmother Momona Kanohokai. Countless other aunts, uncles and close family ties surround. In my last few visits there I’ve been working at photographing the headstones in the churchyard. With umbrella shielding the steady rain we added another 30 headstones to our growing collection of documentation yesterday morning. Many of the headstones are quite ornate with carvings and designs. Some with photos of the beloved, so haunting. Ever more haunting the headstones of infants. Today is my grandmother Marilyn Hann Jin (LEE) Fernandez’ birthday. She would have been 91. She died at an early age the day after her last child, my Uncle Lee, was born due to complications during delivery. I’ve only ever known her from photographs, other’s stories and memories, and my own quiet visits to her graveside through the years. She grew up nearby on Rooke Avenue and her mother and my grandfather’s mother were good friends at the Sunday School. It’s where they met and fell in love.